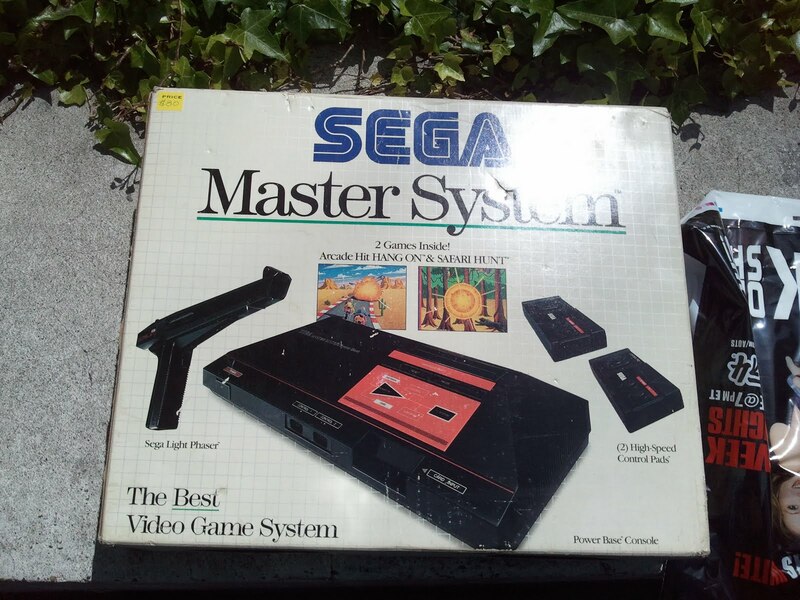 So just recently I purchased a mint, in box, Sega Master System, yes you may all commence drooling now. 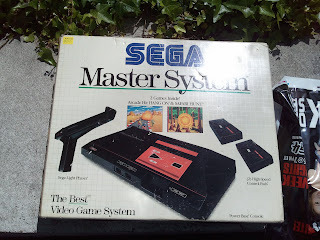 Well the Master System comes pre-loaded with two games, Hang-On which is a motorcycle racing game and Safari Hunt, the Master System equivalent of Duck Hunt minus the snickering dog. The day I bought the system I hooked it up, rediscovered how terrible I am at racing games, even games from the 80's and then tried to play Safari Hunt. While I could select the game from the menu screen, the gun, or Phaser according to the paperwork, wasn't doing anything. At first I thought it was broken but looking down the scope with a camera proved that the little infrared light was blinking on and off. I wasn't too concerned since I'm not planning on playing the preloaded games all that much but it still kinda irked me. At the time I didn't have room for the system out on my main TV so I hooked it up in the bedroom, and... the phaser suddenly started working on that TV. Now my main TV is a flatscreen LCD and my bedroom TV is an old CRT from when I was in high school. The CRT TV still has a flat front but it's got the big bulky rear for the tube and wiring and whatnot and weighs about fifty pounds. But the phaser gun worked perfectly on this TV. So naturally I had to see if this was a fluke or not. Back out on the LCD TV I fired up Duck Hunt on my NES and .. no go. I wasn't even able to select the Duck Hunt option from the menu. Just to rule out that this wasn't an ancient technology issue I put Duck Hunt into the FC Mobile II and used the zapper gun that came with that and still nothing. Then I tried them both in the bedroom and they worked perfectly. So I went on a quest to find out what gives, and surprisingly not many people have had this problem, probably because when you fire up your NES the last thing you want to play is Duck Hunt. So instead I tried to figure out how those guns even work. So according to How Stuff Works the light guns work by blanking the screen, in the 'eye' of the computer anyway, and then turning the target object white (or the reverse depending on the system) and then waiting for the vertical retrace to refresh and depending on if the point where the gun hit is black or white you scored a hit. This also explains how that old trick of putting a white piece of paper in front of the gun to score only perfect hits works. You dirty cheaters you. Now granted I fail at electronics, I barely understand how light bulbs work, but I think I see the problem. So CRT TV's have a vertical and a horizontal retrace signal which align the picture for you. This would probably be why you get that freaky horizontal scrolling when your TV starts to go out. Now LCD TV's on the other hand work off of liquid crystals and shutters and polarizing plates and lots of other concepts I won't go into because I can barely comprehend the technology that turns the light in the refrigerator on. But basically the guns don't work because they function off a technology that newer TV's don't use. Which is as good a reason as any to keep that crappy CRT TV around. 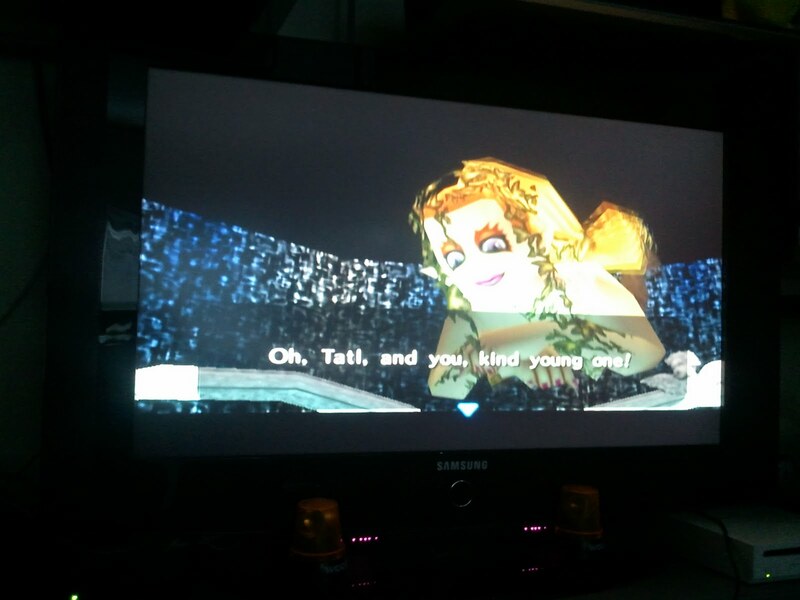 Not to mention that some older games just don't look as good on giant LCD screens. So there you have it. Your daily dose of video game nostalgia and science. I can now play Safari Hunt to my hearts content. Or until Sonic 2 gets here. Whichever comes first. April is the most dangerous time of the year for me. This is the season where I've gotten my tax return and, like a responsible adult, have paid bills and put it into savings. But now, now I sit around in my remaining poverty adding to the stereotype that all gamers play video games in their underwear while eating Doritos right out of the bag. I don't go outside because I can't afford to put gas in my broken car, getting a lovely basement pallor that would make Sephiroth look swarthy. And I struggle through it because hey, that's what being an adult is all about. And then the Navi of credit cards makes its presence known. I'll open my wallet to look at my license and assure myself that I'm actually a living, breathing human being and a tiny bit of blue plastic poking out will suddenly become the most obnoxious thing on the planet. "Hey, Listen!" It'll scream. "You don't have any money but think of all the cool things you could buy with me! Hey! Hey! Wouldn't that be cool?" At this stage the thing is easy to ignore. I'm an adult. I'm perfectly content to cycle through Netflix instant on three different systems and convince myself I'm actually looking at a high tech series of multiple monitors at Skynet. Then the credit card amps up its game. It's guilt trip time. And it sounds suspiciously like the hoarder woman from Labyrinth. "Don't you like your friends? Go out to coffee with them! Go to the arcade, go eat that salame out of a cup you like so much. Hell, with the limit on this thing buy them all iPads and challenge them to Words with friends. Wouldn't you like to see them and do things? You like things!" But I can selfishly hold out. I can overcome. By this point I'm on my 96th straight hour of Katamari, eying things on the floor and wondering why I can't pick them up by stepping on them. My NES has overheated, the FC Mobile is surrounded by a pile of used up batteries which I've attempted to fashion into a crude cat condo and I've spent an entire day trying to swim to the island in Goldeneye. And then my resolve breaks. And it's always Wesker. "You don't need those pathetic fools. You've worked, you've been responsible. Incompetence surrounds you so reward yourself. 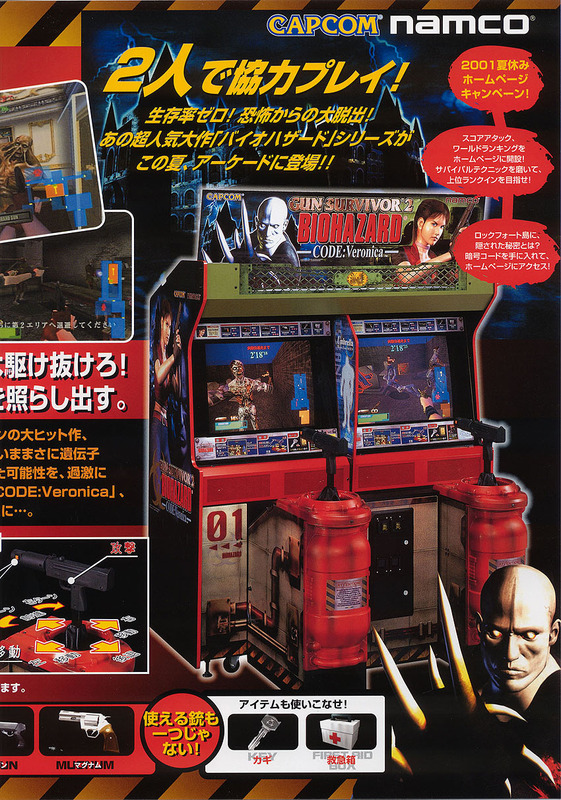 Say, perhaps, with one of these suitable arcade machines like this specimen to the right." And I have worked hard! At beating the high score on Pac-Man. And I have been responsible! In that I remembered to pay rent at least twice. I do deserve something awesome! And that's how I end up with multiple Dreamcasts, three laptops, and action figures I don't have places for. But this year, as I've said every year, this is the year I won't give in. This is the year I level up into "Real Adulthood." I have a +8 to my willsave this year. I can do this. This woman is not at all what I'd imagine the Great Fairy to look like. Not only is she an amalgam of Poison Ivy and a transvestite mermaid, but her sound effects are horrifying. She's supposed to be giggling, but it sounds like a shriek of agony. In fact it sounds like the scream of those misshapen guys in Silent Hill: Shattered Memories, the ones who hug you to death. I'm not quite sure what this animation was supposed to be, but it certainly looked like he was doing unspeakable things to this organ grinder while reminiscing about a dog. And then there's this guy. He doesn't look suspicious at all right? Just shirtless, at eleven o'clock at night, chilling in the corner next to a playground slide. Totally normal. Nothing to be concerned about. Imagine my shock when it turned out this fine upstanding gentleman was in fact a purse thief! Scandalous. I'm gonna keep chugging along on this game. And now I'm super motivated. Because this past weekend I bought myself one of these. That's right, in the box. With the manuals. I fired it up to shoot some ducks and fish and I could barely contain my glee. For those not in the know, the Master System rip off of Duck Hunt has one incredibly amazing upgrade: There's no snickering dog. And for that alone this system should have decimated the NES. After Majora's Mask is all complete I'll be moving on to Altered Beast on the Sega Master System. Majora's Mask Part 1 of AUGH THE MOOOONNN! In case you didn't know, today, (well technically yesterday) was the 25th anniversary of the release of The Legend of Zelda. In honor of this I played about 15 minutes of the original NES game in all its golden cartridge glory. Then promptly got lost in the woods, gave up, and decided to play something else. 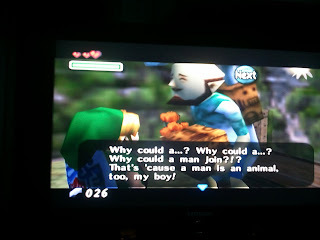 So I decided on Majora's Mask which is a game I hadn't played before but I've heard lots of good things about. My local gamestore didn't have a copy of the N64 version so I decided to just buy it on the wii. 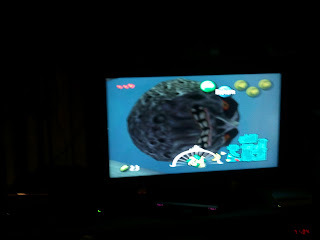 Which, while I intensely dislike the gamepad controller for the wii, is convenient and I'm lazy so it all worked out. So the game starts out lovely. The sun is shining, the music is upbeat and delightful, I'm cruising the forest on my pony, I mean my horse, and then suddenly, some jerk in a mask and his two hench-fairies, come out of nowhere and steal my horse! The jerks. 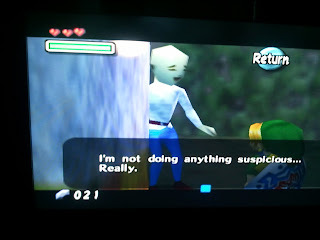 Link gives chase only to find out that not only did he apparently kill my pony-horse but he stole my ocarina and then turned me into a depressed emo tiki guy. Sad Deku Link is sad. 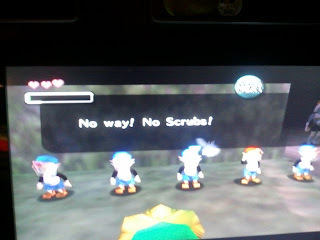 So I get my own personal fairy assistant who is 8 million times less annoying than Navi. So far not a single instance of: HEY LISTEN. 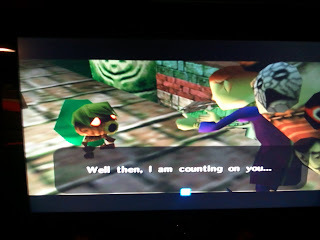 So I have to get a creepy peddler his mask back in 3 days. 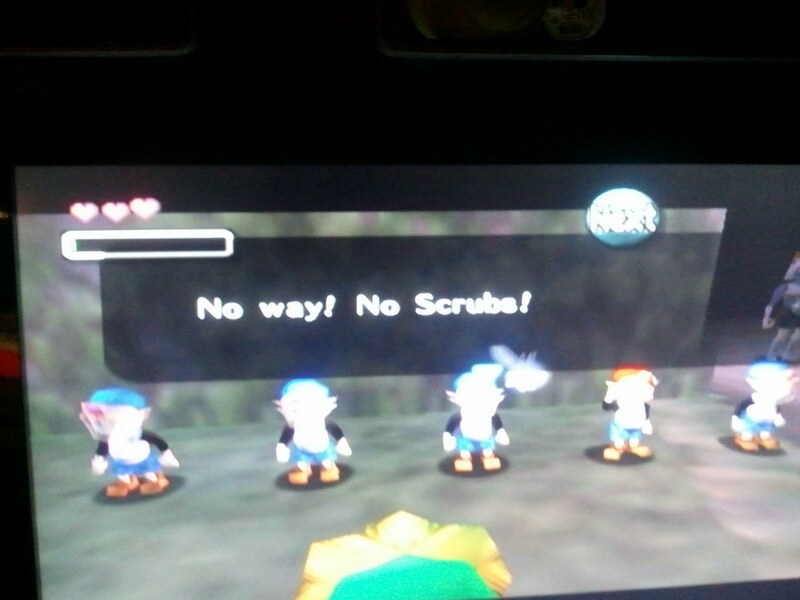 From some guy named SKULL KID. Shouldn't be that hard right? Except that 3 days is only about 35 minutes in game. So uh.. Sorry about this people of Clock Town. So far I've played hide and seek with a bunch of kids who I half expected to hit me with yo-yo's while screaming PK FIRE, I kicked a chicken, got a nifty wallet and let a disembodied hand coming out of a toilet wipe itself with the deed to a giant flower. All in all today was time well spent. 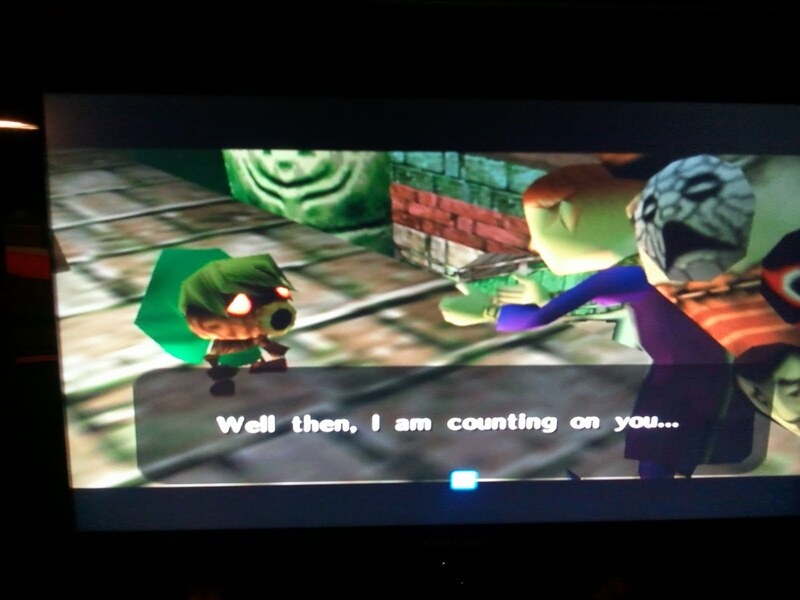 I've got to say I can't really take a villain named SKULL KID all that seriously, even with the mask of doom and the ability to make the moon try to eat me. But I was pretty impressed with the way the days passed. At the end of each day the clocktower bongs the time and the screen closes in on you. Slowly. In time with the clock. Cue the panic. So I'm two hours into the game. Which would be a lot less if I hadn't casually wandered around town talking to jugglers while being threatened with the most deadly lunar eclipse in history. So now the game really begins. New and improved header drawn by the amazing Matthew Elser. And that is exactly how I play every game ever. Don't touch R.O.B. He has an itchy trigger finger. And he cheats at duck hunt. Daily Poem #3. What do you mean it's late? Graduate of Academy of Art, San Francisco. VFX and Textures and General video game nonsense.